It is with great JOY that I finally, finally announce a beautiful secret that I've been holding on to for a few months now. Baby R will be making an appearance in May 2014! Ian and I are beyond excited ... I can't even describe it. Oh congrats!! I saw someone post something about a "surprise" on IG the other day and was wondering. I can't wait to follow along your journey! Congratulations!! I knew it! A few weeks ago I started having this idea about you and then especially when you guys were with friends who had a baby. For some reason I could just see it. Yay, yay, yay!!! APRIL!!!! This is such exciting news. 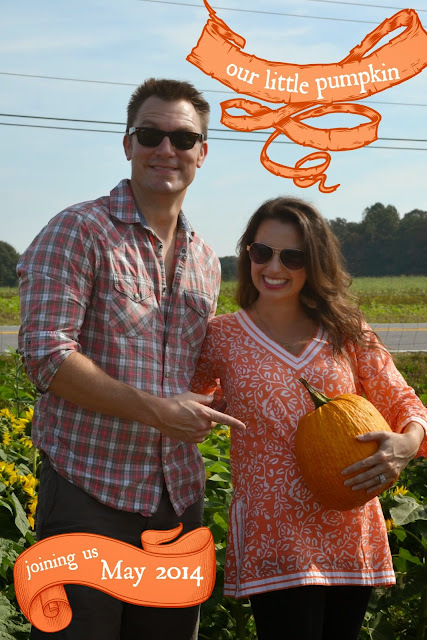 I am over the moon happy for y'all :) Yay for another Charlotte baby!! CONGRATULATIONS!!!! What exciting news! I can't wait to follow along on your journey and hopefully meet you soon! I had a feeling when I saw your punch with the vodka "optional" - congrats! That will be one gorgeous baby! Im a recent new follower and CONGRATULATIONS on the news!! I am looking forward to following your journey to parenthood! OH MY HEAVENS CONGRATS to you both!!! Now I will look forward to following your journey as a mommy-to-be!!! Oh my gosh, I am so so so happy for you both!!!!!!!! Congratulations!!! I've been waiting to hear this fabulous news! I am so excited for y'all!!! CONGRATS! Obviously my exclamation point-filled email captured my first wave of emotions, but CONGRATULATIONS again!!! Congratulations!! That is wonderful news! so happy for you :)how exciting!!! i knew something was up. you didn't look nearly drunk enough in your halloween pictures. :) congrats. I had a sneaking suspicion we might be hearing this news soon, or at lease I was hoping! Haha SO happy for you, friend! Congratulations to you both!!!! Congratulations! How exciting??! Can't wait to follow you on your journey through the blog! Yayee!!!! I had a feeling this was coming! So excited for you two! I am feeling a boy for some reason :) not that I've ever been right. Ha. Congrats!!!!! Oh my gosh, so exciting!!!! Congrats!! Oh.My.Goodness!!! I am SO happy for you and the hubs! :) I can not wait to see you in person so I can rub your belly and give you a big hug! Looking forward to hearing more about this journey!! Yay!!! Congratualtions!! We will have quite the blogger baby playdates come next summer :) Looking forward to watching your bump grow and to hear all about how your feeling. Let me know if you need anything! So so happy for you and Ian!! Congratulations! Being pregnant for the first time is the most wonderful feeling! You're in for the most amazing ride of your life! I screamed "YAY!" at work this morning when I read the FB post. So excited for y'all!! Congratulations!! So excited for you all!! Being a mom is the best thing I've ever done, hands down! You're going to love it. Hope you've been feeling good. YAY! Congratulations!! You are going to be the cutest pregnant lady! So, SO happy for you and Ian. Y'all are going to be precious parents! You and Christina....May will be a great month. APRIL!!! I am SO beyond excited for you. You're going to be the best mommy - that baby is going to be so loved. Yay! I was thinking it would come soon...My hubby and I went to Europe before we started trying ;) Spring is a wonderful time for a baby. My first was due on May 1 (but came April 29). Congrats!!! Yay!!!! Congratulations! I am thrilled for you! You are going to be such an amazing mommy! Congrats!! Hope your feeling well! Soooooooo exciting! Congrats pretty lady! You are going to be a wonderful momma - I can't wait to follow your progress! Ahhhh! Congratulations! It's seriously the most fun (although hard at times) thing in the entire world! Congrats girl! You are going to be one stylish and amazing momma! Welcome to the best (and hardest) club in the world! Blog official--YAY!!! Congrats again. You're going to be wonderful parents! Congratulations April!! That is so exciting! Can't wait to hear more about it! Such awesome news to share! Congratulations!! Oh my gosh! Congratulations, April! So excited for you! Congratulations on your growing family!! I can't wait for all of your fun posts! YAY!! This is such an exciting new! Congratulations to you both :-) I know we will all be excited to share in this journey with you via your blog! Congratulations! It is truly the best news! Oh April this is so exciting! Congratulations! Congratulations! I am so excited for you and Ian! OMG!!!! Congratulations!!!! You need to join my Charlotte mommy group. We have so many pregnant friends among us right now- including me. I'm due in April. Love this post! Absolutely fabulous! Congratulations, and enjoy every moment of this wonderful time (and like so many others, I wondered if this was imminent!). Ahh!! Can't wait to follow along!! :) Congrats!!! It just occurred to me, something is in the water up in Charlotte - you AND Carolina Charm! So looking forward to reading about both of your journeys! Oh Congratulations! Being a mama is such a blessed opportunity & of course a wonderful journey! Enjoy the ride, Mama! OMG congrats! I love how you told everyone, how cute! I can't wait to follow your momma adventures now! Aaaaah!!! I am beyond THRILLED for you both! Such wonderful news! :) Congratulations!!! Congratulations on your wonderful and exciting news!! CONGRATULATIONS!!! Such a wonderful blessing! You two will be amazing parents! HURRAH!! I am so thrilled for y'all!!!! I had a hunch - such a hunch - and am so glad I was right! Really thrilled for you both. So in love and a baby makes three (or four counting beloved dogs!). Congrats!! How exciting!! Love that top too, so pretty! Hi! Long time reader, first time commenter :) Congrats!!! I was hoping that you'd answer a quick question - how did you get that cute writing on your announcement? Is it a specific program or something? It's so fun!